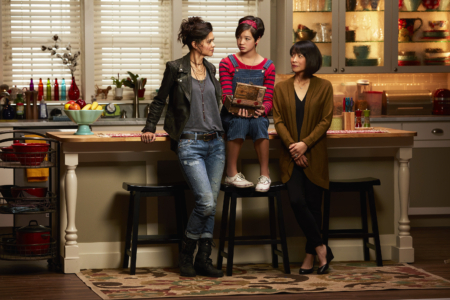 She’s also learning to navigate press junkets like a pro, as she — along with executive producers Terri Minsky (the creator of Lizzie Maguire) and Michelle Manning (The Breakfast Club, Sixteen Candles), Lauren Tom (who plays Celia Mack), and Lilan Bowden (who plays Bex Mack) — sat down separately with CAAM to talk about their new show. 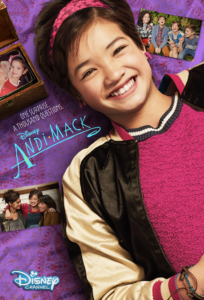 Andi Mack is about a regular 13-year-old girl Andi who lives a rather sheltered life. A talented artist, Andi makes personalized bracelets out of found objects in her backyard hideaway, fittingly labeled the “Andi Shack.” She’s the type to say things like, “You guys are taking all the fun out of learning at dinner,” when some family bickering gets in the way of the memory games she loves to play. Her two best friends, Buffy (Sofia Wylie) and Cyrus (Joshua Rush), are just as giddy and optimistic as she is, but they know her well enough to call her out when she’s trying to pretend everything is okay when it’s not. Andi’s life changes dramatically when her adult sister Bex moves back home and unleashes a box of family secrets. There’s actually a literal box, wooden and filled with photos from Bex’s past, which reveal that Andi’s family may not be who they seem. 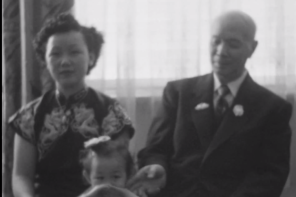 The new Disney family is of mixed-race, Asian and white, but it wasn’t originally written that way. However, as soon as it became clear that Lee was the right actor for the part, Minsky and Manning built the family around her. “It’s crazy to even hear that all of this is influenced by me,” Lee said. Tom, who plays the matriarch of the family, may be most known for her work on The Joy Luck Club, Friends and Futurama, but Minsky was a fan of her work on The Newsroom, where she played a similarly tough-talking character. Celia harbors much bitterness for Bex, because Bex is a threat to the sheltered, problem-free world Celia has created for Andi. Stoney Westmoreland plays the more easygoing father, who’s trying to figure out how to move forward, now that a major family secret has been revealed. [SPOILER ALERT ahead]. Minsky found the inspiration for the series from an unlikely source: Jack Nicholson’s family history. She had read that Nicholson was raised by parents turned out to be his grandparents. His biological mother was the woman he thought was his older sister, but because she was impregnated as a teenager by a man who didn’t stick around, his grandparents agreed to raise him as their own and never reveal his true parentage. Nicholson only found out later in life, in his mid-30s, because Time Magazine researchers discovered the truth while working on a profile of the actor — but it got Minsky thinking: What would it be like if this type of shocking family secret was revealed to a young pre-teen girl, who’s just starting to form her own identity? 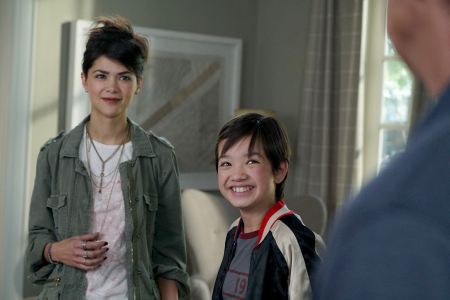 Lilan Bowden and Peyton Elizabeth Lee star in Disney’s new show, Andi Mack. Photo courtesy of Disney Channel. It’s an unusual premise for a kids show, but it’s told with much empathy, setting up a serialized story in which both Andi and the audience learn more about their family with each episode. What does it mean that Bex, who Andi had always considered her cool, rebellious older sister who was living away from home… is really her mother who abandoned her? What happened between her mother and grandmother that has resulted in so much tension over the years? And who is her father? These are heavy questions, but the show balances these serious issues with many lighthearted moments. Equally important in the eyes of the 13-year-old: What will her friends think? And did her eighth-grade crush, the sparkly-eyed Jonah Beck (Asher Angel), really just invite her to be a part of his frisbee team? For Bowden, there hasn’t been a character she’s auditioned for that she’s wanted to play more. Bex, a free spirit who makes an entrance on a motorcycle, tries to teach Andi how to be brave and take risks, but she also has some painful parts of her past that she’s not ready to share. 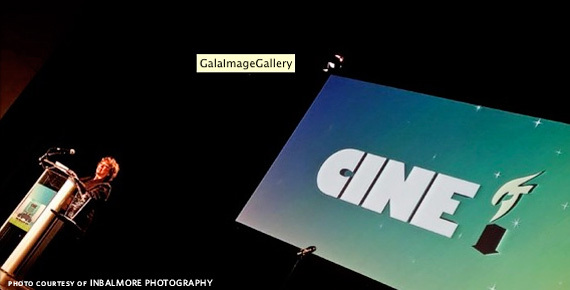 Though the show is aimed for kids and young teenagers, older audiences can also appreciate the quippy dialogue and imagine what they’d do if they were a member of the Mack family. Ada Tseng is a writer whose work has been featured on Public Radio International, NBC News Asian America, NPR’s Code Switch, and LA Weekly, and she’s a former editor of XFINITY Asia, Asia Pacific Arts and Audrey Magazine. She hosts the podcasts Saturday School and Bullet Train, and she’s the creator of Haikus With Hotties. 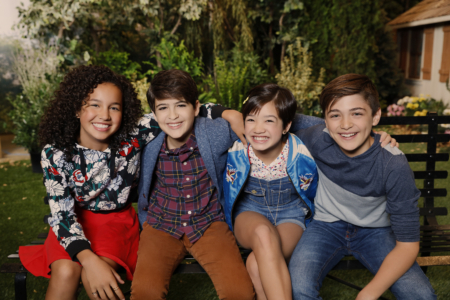 The first episode of Andi Mack is available on YouTube (below). Are you kidding me? She married a man she loved. His race doesn’t matter. End of story.